Kampai! Cheers! The sake bottle and cup emoji, 🍶, shows a carafe of sake, or Japanese rice wine, and a traditional sake cup. Especially by people who are Japanese, the emoji is often used for joyous or celebratory occasions that call for the alcoholic beverage, sake. Or, just a nice sushi outing. Sometimes Westerners confuse the sake bottle and cup emoji for a carton of milk. Fun. Second foster dog just given forever home. / Some tears. / Then a sake bomber. / 🍶😅 / Cheers to you little Short Stack! Sake, sometimes spelled saké, is a type of Japanese wine made from rice. Sake is Japan’s national beverage and an important part of Japanese culture. Traditionally, sake is heated slightly and served in a small earthenware or clay flask called a tokkuri, then poured into small, typically porcelain drinking cups called choko or ochoko. These accoutrements for drinking sake, collectively known as shuki, are what the sake bottle and cup emoji shows. The sake bottle and cup emoji was approved under Unicode 6.0 in 2010. On some platforms, like Google, the emoji appears as a tan tokkuri, a bulbous container with a narrow neck, with a small white ochoko to the left. On other platforms, such as Apple, the containers are both white with a blue band along the bottom, a traditional ceramic design for sake-ware. Every platform has a slightly different artistic rendering of these shuki, as the screenshot from Emojipedia highlights below. The sake bottle and cup emoji is most popular, unsurprisingly, among Japanese people. What is surprising, though, is that Google Trends data shows search interest in the sake bottle and cup emoji limited to Japan and the United States. The sake bottle and cup emoji is used to illustrate celebrations that involve, well, sake. But this usage is pretty expansive: The sake emoji can be used to indicate any kind of celebratory meal involving drinking and partying, not just exclusively sake drinking. Because the sake bottle and cup emoji pops up in celebratory situations where folks are drinking, it’s often paired with the clinking beer mugs emoji 🍻 and other alcoholic beverage emoji. 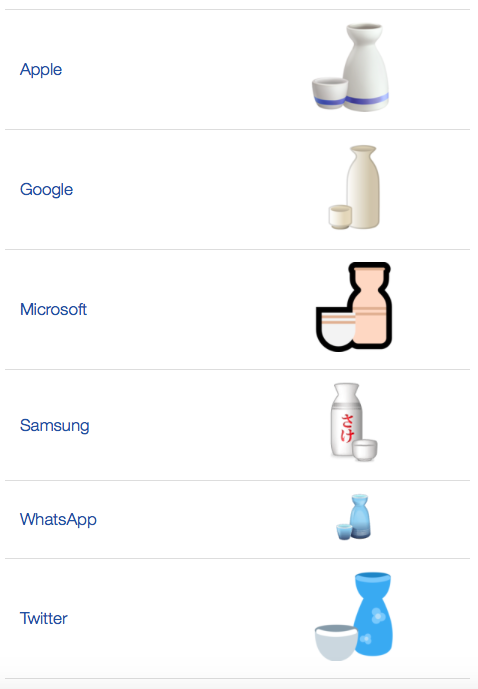 Some Western social-media users mistake the sake bottle and cup emoji as showing a milk carafe or drinking vessels for other beverages. As a result, sake bottle and cup emoji appears not infrequently in posts about breakfast and other lactic treats. That’s a breakfast of champions.